Love books? Here’s how to win some great ones. As you may know, the Bord Gáis Energy Irish Book Awards will be taking place in Dublin on Wednesday 26 November, recognising the very best of Irish literary talent. Nominees this year include Roddy Doyle, Colm Tóibín, Joseph O’Connor and John Boyne, as well as Cecilia Ahern, Roy Keane, Brian O’Driscoll and Cathy Kelly. The awards are democratic: winners are decided by a a public vote on each category (you have until 21 November to get your votes in here), with equal weight given to a panel of around 300 book experts, including librarians, critics, authors and booksellers. And we may be digital, but even TheJournal.ie is getting in on the act this year. We’re sponsoring the category of Best Irish Published Book of the Year which honours indigenous publishing houses and their publications - and we’re giving two lucky readers the chance to win all six of the books that have made the shortlist. What date do the Bord Gáis Energy Irish Book Awards take place on this year? Send your answers to irishbookawards@thejournal.ie by 6pm on Tuesday 18 November, along with your name, contact number, and address (so we can post the books out to you if you win). The two winners will be chosen at random after the closing date and will be notified either by email or by phone. Email “COMPETITION: Win a big haul of books from this year's Irish Book Awards”. 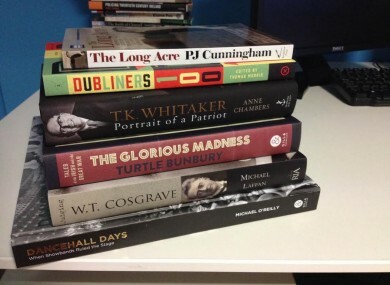 Feedback on “COMPETITION: Win a big haul of books from this year's Irish Book Awards”.